Suwannee Springfest celebrates its 18th year at the magnificent Spirit of the Suwannee Music Park in Live Oak, FL on March 20-23rd. Festivalgoers can enjoy four days of camping and live music, arts and crafts, and a selection of great foods. Suwannee Springfest consistently features some of the world’s finest performers in Roots Rock, Bluegrass & Newgrass, Acoustic Blues, Singer/Songwriter, Cajun/Zydeco, New & Traditional Folk and other forms of American Roots music. Tickets are on sale in advance and at the gate. 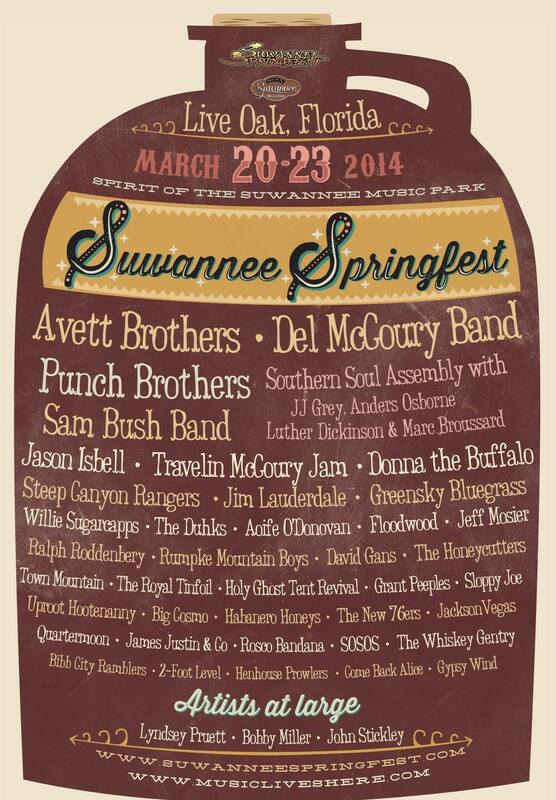 Suwannee Springfest is excited to welcome to the 2014 stages The Avett Brothers, Del McCoury Band, Punch Brothers, Sam Bush Band, Jason Isbell, Southern Soul Assembly (JJ Grey, Anders Osborne, Luther Dickinson and Marc Broussard), Travelin McCoury Jam, Steep Canyon Rangers, Donna The Buffalo, Jim Lauderdale, Greensky Bluegrass, Floodwood, Town Mountain, Willie Sugarcapps, The Duhks, Aoife O’Donovan, The Honeycutters, David Gans, Rumpke Mountain Boys, The Whiskey Gentry, Henhouse Prowlers and many more. The full schedule of events is now available online at suwanneespringfest.com/lineup/schedule. This energetic and family friendly musical celebration is a gem of a festival with a great lineup, spring weather and a stunning natural setting. Tickets for Suwannee Springfest are on sale in advance for $170 ($190 at the gate) inclusive of all taxes and fees, and include 4 days of primitive camping and music. Kids under 12 are invited to join for free. Fans can also upgrade their experience with VIP tickets for $300. For RV hook ups, cabin rentals and golf cart rentals, please call SOSMP at (386)-364-1683. 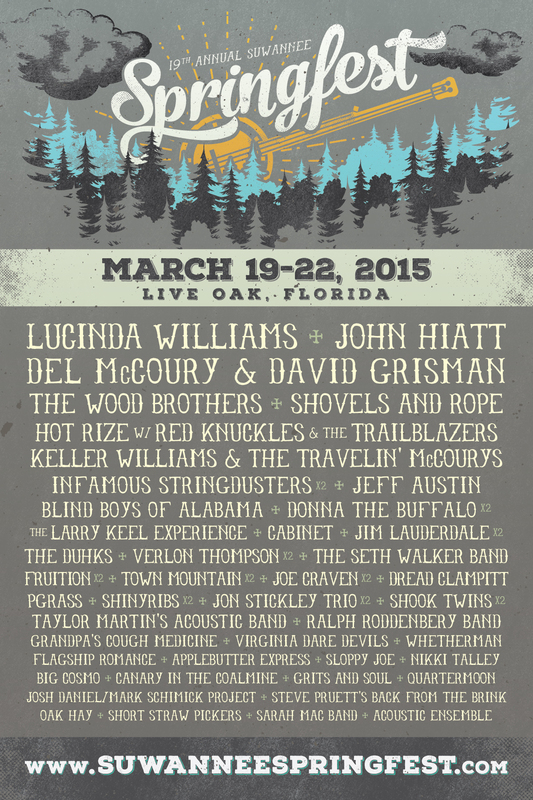 For further information and tickets, please visit www.suwaneespringfest.com. Spirit of the Suwannee Music Park, located just north of Live Oak, FL, is a one-of-a-kind music park and premier 500+ acre campground nestled on the shady banks of the historic, tea-colored Suwannee River in North Florida. SOSMP hosts a variety of events throughout the year including Wannee, Magnolia Festival, Bear Creek Music and Arts Festival, Hulaween, Aura Music Festival, The Purple Hatters Ball, The Zach Deputy Disc Jam and more. In addition to these events, the park offers live music during the week in the Music Hall and a natural amphitheater for outdoor music festivals. Along with the camping, there are nearly 12 miles of trails suitable for hiking, biking, horseback riding and nature exploring. Bring along a fishing pole and wet a line from the dock on Rees Lake. Canoe and bike rentals are available at the on-site canoe outpost. Or take a dip in the nearby Suwannee Springs. SOSMP is located between Jacksonville, Florida & Tallahassee, Florida about 30 minutes south of the Georgia State line, about 45 minutes north of Gainesville. Please visit the park’s web site at www.musicliveshere.com or call them at 386-364-1683 for more information. 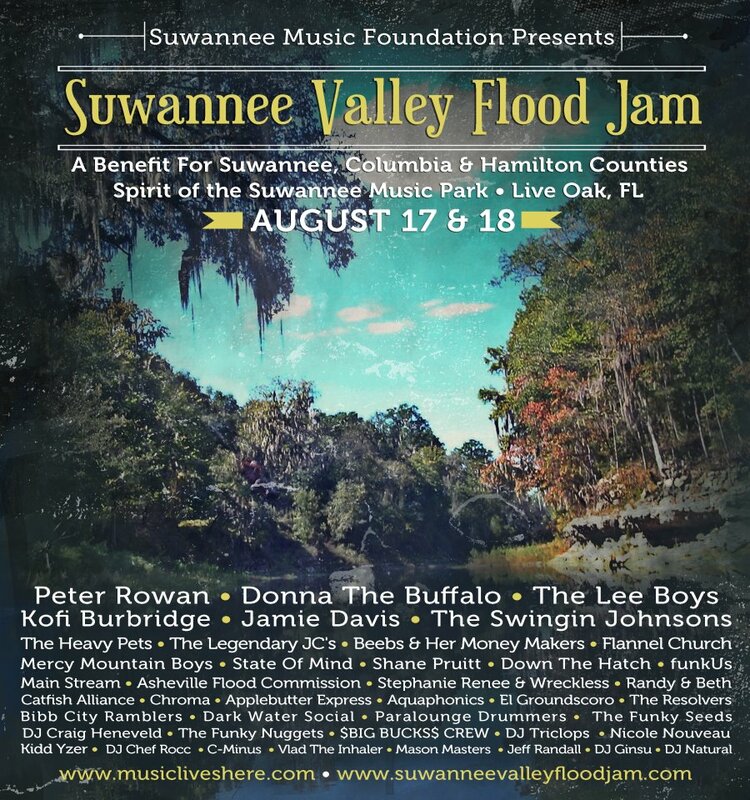 Suwannee Valley Flood Jam: August 16-17th ~ Peter Rowan, Donna the Buffalo, The Lee Boys and more! The Suwannee Music Foundation in partnership with The Spirit of the Suwannee Music Park today announce Suwannee Valley Flood Jam: A Benefit For Suwannee, Hamilton & Columbia Counties on August 17 & 18 at The Spirit of the Suwannee Music Park in Live Oak, FL. On June 24, 2012, Tropical Storm Debby settled over north Florida for 4 days, dumping more than 25 inches of rain in some areas of Suwannee, Hamilton and Columbia Counties. The Suwannee River rose to near record flood levels and dozens of sinkholes developed around those counties, destroying many businesses and homes while making roads impassible. 1500 families were flooded out of their homes – many left without shelter, cars, clothes, food or any worldly possessions. The flood affected over 10,000 other people throughout the tri-counties. More than 25 bands including Music Park favorites Peter Rowan, Donna the Buffalo, The Lee Boys, Jamie Davis, The Swingin Johnsons, The Heavy Pets, The Legendary JC’s and many more will fill up the special Suwannee Valley Flood Jam line-up. Full lineup below. 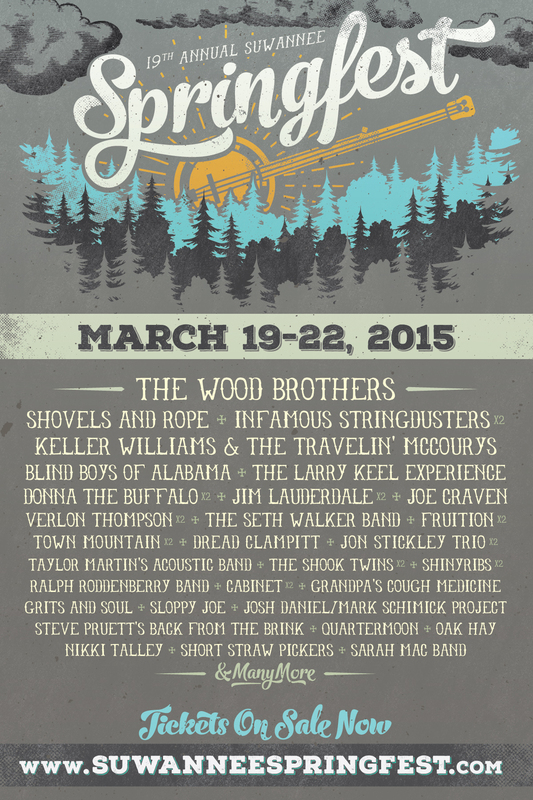 Two-Day Tickets are $45 in advance, $65 at the Gate and include primitive camping. Single-Day tickets cost $20 per day and are available only at the gate. Day tickets do not include primitive camping. An on-line charitable auction will also be available to those not able to attend. Whether in person or not, folks will have the opportunity to bid on a variety of great items including artist memorabilia, diamond and gold jewelry, music instruments, collectible items and much more. Stay connected to www.musicliveshere.com for updates, to view the online auction and to purchase tickets. One hundred percent of net profits from the Suwannee Valley Flood Jam will be donated to locally based charities, Love INC based in Live Oak, FL and The United Way based in Lake City, FL. Since the flood began, the Suwannee Music Foundation and the Spirit of Suwannee Music Park have partnered with Love INC. to deliver supplies and provide relief to affected households. These charitable efforts by music lovers everywhere have helped hundreds of people who in this desperate time of their lives have virtually nothing. Volunteers at both agencies, along with many others throughout the three counties have donated thousands of hours to help family, friends and complete strangers, wading in waist deep, contaminated water to bring out previous personal belongings, prized children’s toys and helping families find suitable temporary homes. Suwannee Valley Flood Jam Lineup is as follows: Peter Rowan, Donna The Buffalo, The Lee Boys, The Swingin Johnsons, Jamie Davis, The Heavy Pets, The Legendary JC’s, Mercy Mountain Boys, Beebs & Her Money Makers, Flannel Church, Kofi Burbridge, State Of Mind, Shane Pruitt, Down The Hatch, Main Stream, funkUs, Asheville Flood Commission, Stephanie Renee & Wreckless, Randy & Beth, Catfish Alliance, Chroma, Applebutter Express, Aquaphonics, El Groundscoro, The Resolvers, The Funky Seeds, DJ Craig Heneveld, The Funky Nuggets, Flt Rsk, $BIG BUCKS$ CREW, DJ Triclops, Kidd Yzer, DJ Chef Rocc, C-Minus, Vlad The Inhaler, Mason Masters, Jeff Randall, DJ Ginsu, and DJ Natural. Love INC. (Loveinc-suwanneecounty.org) is a Non-Denominational Christian organization which is a registered 501(C)(3) charity and operates under the tax exempt guidelines as designated by the IRS. Love INC. has been providing food and services to the people of Suwannee County from day one and has demonstrated a commitment to keeping overhead low and keeping all donations here in the immediate area. The United Way of Suwannee Valley works to assist at risk households recover from natural disasters. The Suwannee Valley Long Term Recovery Committee assists at-risk households recover from natural disasters through various social services. These agencies include senior care for impacted house households with residents age 60 and over, legal services to assist with legal issues arising in disaster situations, and various agencies that assist affected households with food, water, household items, clothes, rent, and utility assistance.